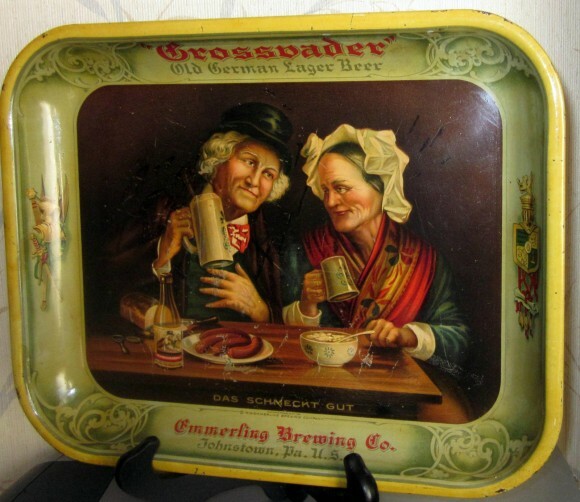 Serving Tray for Grossvader, The Old German Lager Beer from The Emmerling Brewing Company out of Johnstown, PA. The center of the tray shows an elderly couple dinning in and enjoying their mugs of the company’s brew. Below the table is the caption “Das Schmeckt Gut” which means “That tastes good”. The couple is beautifully illustrated on this rectangular tray measuring 14″ x 11″ from the early 1910s. The border also has nice detail at the corners with stylized baroque motifs and coats of arms and heraldic symbols on the sides. Everything about it drives home the German heritage, which would fade from advertising products by the time they became our enemy in the World Wars.